I was lucky enough to attend the John Frieda Luxurious Volume launch in the Morrison Hotel this week. The event was really great, I got to meet some other lovely bloggers, as well as John Frieda's Senior Stylist Jake Davis. The theme of the evening was the launch of the newly updated Luxurious Volume Range from John Frieda. I was really excited to see what was in store as I am a huge fan of voluminous hair. I have tried a lot of products in the past so was looking forward to seeing how this range compared. Jake talked about how in the past big hair was BIG and the products used were sticky and made your hair hard. 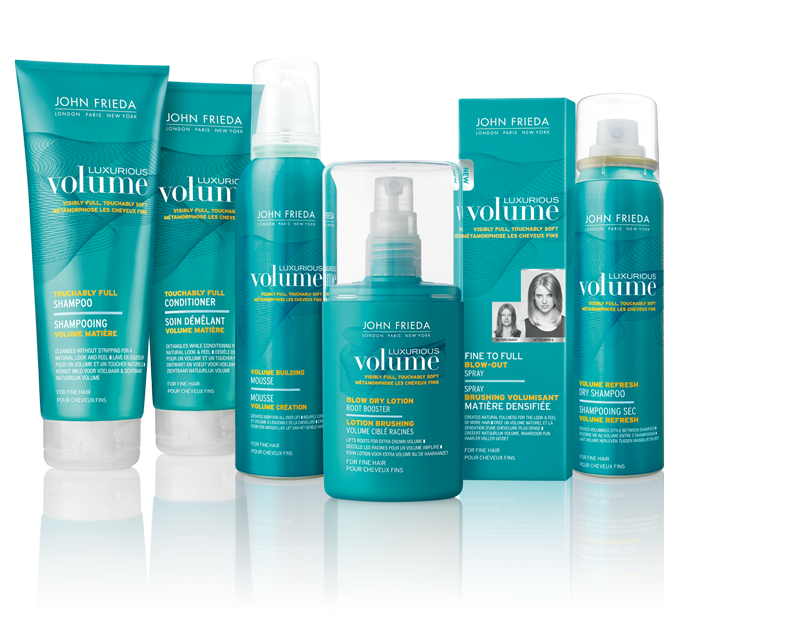 John Frieda's product is for a more modern definition of volume - natural, weightless and no residue. I was also really interested to learn that John Frieda was one of the first people to create proper haircare products back in the 80s and got his big break on Richard and Judy! Jake showed us how to use the products and what we could do to get more volume in our hair - for example gently pulling hair at the roots while blow drying to get more root definition. He invited us to touch the model's hair at the end to prove there was no residue or hardness and he was right! Afterwards, I was very excited to try the products out for myself. I was kindly given a goody bag with 5 products from the range to review. The next day I used the Touchably Full Shampoo and Conditioner, along with the Root Booster Blow Dry Lotion. I can absolutely say, my hair has never looked better without visiting a salon. I also hardly had to straighten my hair afterwards which was a brilliant side effect! It's hard to describe how it feels in your hair, it makes it feel plumper but not in the way you expect from other volumising products. I also really liked the fresh smell. I really was so pleasantly surprised at how well this worked as you often hear a lot of gimmickry that doesn't hold up in real life. I washed my hair again today and this time used the Fine to Full Blow Out Spray. I think this product gives slightly less volume. My hair still looks good though and it's much easier to style my hair than without any product. I think I prefer the Root Booster to the Blow Out Spray as, for me at least, it gives more volume. You can also use them together to multiply the effect which I might try for a night out. I was also give the Volume Refresh Dry Shampoo which I have yet to try. Apparently it's great for giving extra oomph in between washes. Overall, I am really impressed with this range and was surprised to see each item costs only €6.31. I was expecting it to be more. I will definitely be replenishing the shampoo, conditioner and root booster when they run out. John Frieda's website is www.johnfrieda.ie. These products will be available in Dunnes, Supervalue, Superquinn and selected pharmacies. Thank you! Yeah, I thought it would a lot more. Have been using it non stop since I got it, one of the best set of products I've used!